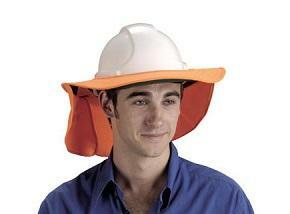 Elliotts Plastic Hat Brims - Proven sun protection, even in the wet! Outdoor workers and workers who are outdoors periodically will be exposed to the sun and the two main hazards this presents; over exposure to UV radiation and heat stress. Australia has the highest rate of skin cancer in the world. Despite being almost entirely preventable, skin cancer continues to affect at least one in every two Australians in their lifetime. The amount of exposure required to cause skin cancer varies greatly from one person to another. However, in most people the risk of skin cancer increases with increasing amounts of exposure to the sun. Effective Sun Protection - provides simple but effective protection from the sun and it' harmful UV rays, helping minimise the risk of skin cancer. All weather protection - effective in all types of weather conditions including rain. The hat brim is manufactured using durable plastic so it does not deteriorate in wet weather. Heat Stress management - increasing the amount of shade available is an important part of any sun safety program. The Elliotts hat brim helps keep you cooler and therefor reduces the risk of sunstroke. ensuring workers drink plenty of cool water. long sleeves, a collar and long loose trousers will increase the sun protection of clothing. Choose fabric with a high ultra violet protection factor (UPF). The UPF rating is outlined in the Australian/New Zealand Standard 4399:1996. A fabric's UPF rating is based on how much UVR is transmitted through the fabric e.g. 45+ is excellent protection. avoid a hat lined with white fabric as it will reflect UVR. Sunscreen is recommended as the last line of defence in addition to shade, clothing, hats and sunglasses. Elliotts is an Australian based designer, manufacturer and distributor of world-class quality safety gear servicing the Australasian market. Elliotts take care to only supply quality protective clothing and equipment that protect people from harm on a daily basis. Products include Specialist Safety Apparel, Welding & Workshop Protection, Gloves & Hand Protection, Safety Work wear & PPE for workers across many industries including electrical, mining, oil & gas, welding & metal fabrication, aluminium smelting, firefighting, chemical, manufacturing and construction. For more information visit www.elliottaustralia.com.